The City of Melbourne has submitted a new plan for a redesign of Queen Victoria Market that seeks to maximise trader and customer experience while also preserving the market’s heritage. Council has asked NH Architecture to develop the options for market infrastructure which were then analysed by SGS Economics and Planning. According to lord mayor Sally Capp, the 40-member People's Panel and the 2015 Master Plan set the direction for the delivery of market infrastructure and the panel's recommendations are being progressed. "We've worked with traders, shoppers, residents, the Victorian Government, Heritage Victoria and the wider community to build a way forward that will allow us to create a thriving open-air market for generations to come," she says. "Under the recommended option to be considered, $6 million will be invested to create cool and dry storage at fruit and vegetable trader's stalls where it's most convenient. The storage would be designed following extensive consultation with traders to get the designs right." The People's Panel set a goal for the renewal to deliver 1000 car parks for market customers. "Under the plan, once the new car parks are complete, the existing asphalt carpark will become a 1.5 hectare public open space called Market Square. We plan to prepare a design brief to create Melbourne's largest new urban public open space," says the lord mayor. "The square will complement the market by creating places where people can eat and attend events and community festivals." Heritage Victoria rejected an earlier design for infrastructure that required digging under the heritage listed sheds. 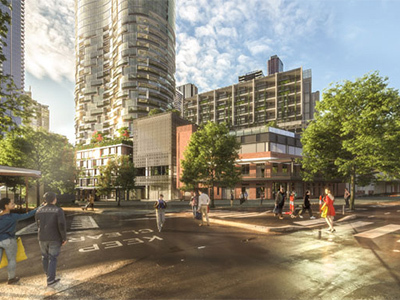 Queen Victoria Market CEO Stan Liacos says, "We need a design that causes the least disruption to day-to-day market operations during construction and I'm confident this option delivers this."